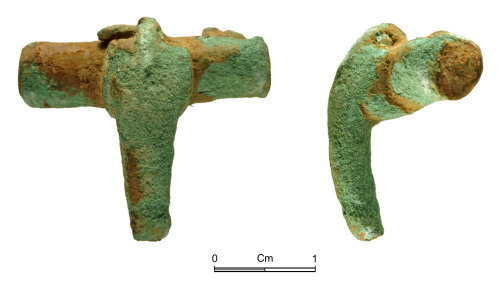 The brooch is fragmentary, represented by the head and upper bow only (with a surviving length of 22.7mm, a surviving depth of 9.9mm and a weight of 7.4g). The brooch employed a copper alloy spring mechanism, a small part of which survives on one side. The spring was secured between lateral lugs and the chord tensioned by a lug at the head. The chord remains within the head lug. The wings are semi-cylindrical (with a width of 25.7mm and a diameter of 7.2mm) and are heavily-corroded although there is the suggestion of grooved borders at the terminals. The bow had curved side mouldings at the head, now corroded (with a width of 9.1mm). The upper bow is of oval section, with straight sides converging towards the break. No decoration now survives on the bow but the lug at the head appears to have defined a midrib, at least as far as the top of the bow. The surface has a brown patina and has a bright-green corrosion.